Willard is a 2003 American horror film co-written and directed by Glen Morgan and starring Crispin Glover, R. Lee Ermey and Laura Elena Harring. It is loosely based on the novel Ratman's Notebooks by Stephen Gilbert, as well as on the novel's first film adaptation, Willard (1971), and its sequel, Ben (1972). It was not billed as a remake by the producers, who chose instead to present it as a reworking of the themes from the original, with a stronger focus on suspense. In addition, Bruce Davison reprises his role as the original film's Willard in portrait form, with Glover's Willard Stiles character being the son of the earlier film's Willard. Willard Stiles (Crispin Glover) is a social misfit taking care of his ill and fragile but verbally abusive mother Henrietta (Jackie Burroughs) in a musty old mansion that is also home to a colony of rats. Willard finds himself constantly humiliated in front of his co-workers by his cruel boss, Frank Martin (R. Lee Ermey), a vicious man who assumed control of the company from Willard's father upon his death by suicide, and whose professional interest in Willard extends to a personal financial one. A co-worker, Cathryn (Laura Elena Harring), has sympathy for the quirky Willard. Cathryn becomes Willard's friend and love interest. Willard quickly becomes obsessed with his friendship with a white rat he names Socrates. Willard then begins to train and befriend the other rats, including an extra large one he names Ben. Ben begins to assume a position of "leadership" among the other rats, while Socrates remains Willard's favorite. After he trains the rats sufficiently, Willard takes them to Martin's home, where he orders them to chew up the tires on Martin's Mercedes-Benz. Willard's mother panics when she overhears the rats and later dies by falling down the stairs of the basement. Now Socrates is all he has left. Willard learns soon afterward that the payments on the house have fallen far behind and that the bank will likely foreclose upon the property. Desperately lonely, Willard begins to bring Socrates to work with him. He then finds a note at his desk declaring that he is being fired by Frank Martin from the company his father founded. While he is arguing with Martin, begging not to be fired, Socrates is discovered by Ms. Leach in the supply room. Her screams alert Martin who bludgeons Socrates to death. Willard, his mental state already precarious, is devastated. He turns to Ben, who is more than willing to guide the colony of rats to help Willard avenge himself upon his boss. Willard and his rats confront Martin and upon Willard's command they swarm onto Martin and kill him. However, Willard mistrusts Ben and attempts to dispose of him and the other rats by putting poison in the basement. He succeeds in killing some, but Ben remains and turns the remaining rat army against Willard. Willard barely escapes with his life and kills Ben, however shortly afterwards Cathryn, who has learned of Martin's death, arrives with a couple of police detectives. An epilogue reveals that Willard has retreated into a semi-catatonic state and has been placed in a mental institution. Unknown to anyone, a white rat appears in his cell which looks like Socrates. Believing that the rat is his only friend reborn, the now scheming Willard (revealing that his semi-catatonic state is faked) tells the rat "It's not over yet, no! Our time is going to come..."
Crispin Glover as Willard Stiles II: A 32-year-old antisocial worker for Martin-Stiles Manufacturing, a business that was originally started by his father but was "stolen" by his boss Frank Martin. Willard is constantly abused by his boss and his beloved mother. He befriends a colony of rats, especially a white rat named Socrates and a big rat named Ben. 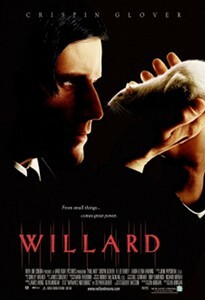 When his torment finally makes Willard angry, he uses his rats to get revenge, transforming into a ruthless psychopath. R. Lee Ermey as Frank Martin: A cruel and uncaring CEO of Martin-Stiles Manufacturing. He constantly humiliates Willard for his late arrivals at work and even kills his pet rat Socrates. He is eventually eaten alive by Willard's rats. Laura Elena Harring as Cathryn: A co-worker and love interest of Willard who sympathizes with him and starts to return his affections - going so far as to angrily quit her job when she learns of Willard's firing, until she realizes his involvement in Martin's murder. Jackie Burroughs as Henrietta Stiles: Willard's ill yet verbally abusive mother who, in her last days, even calls him "Clark" since she hates his real name. Kimberly Patton a.k.a. Ashlyn Gere as Barbara Leach: A cynical secretary for Frank Martin. William S. Taylor as Joseph Garter: A trustee of the Stiles estate who informs Willard of his dire financial straits after Willard's mother dies. Ty Olsson as Officer Salmon: A policeman who discovers that Willard is "nuts". Bruce Davison appears as Willard Stiles I in a cameo appearance. The film opened at #8 at the U.S. box office, grossing $4,010,593 USD. It fell to #13 the following week, and finished with $6,886,089 in domestic box office and $1,660,577 in foreign box office. The film received favorable reviews. It has a score of 64% from all reviewers at Rotten Tomatoes, and 61 out of 100 on Metacritic. Audiences polled by CinemaScore gave the film an average grade of "D-" on an A+ to F scale. Crispin Glover was nominated for Best Actor at the 2004 Saturn Awards. Robert McLachlan won the CSC award at the Canadian Society of Cinematographers Awards for Best Cinematography in a Theatrical Feature. The DVD release was nominated for a Golden Satellite award for Best DVD Extras at the 2004 Satellite Awards. ^ "Fall Frights: WILLARD (Film Review)". ^ "Willard Movie Reviews, Pictures". Rotten Tomatoes. Retrieved 2009-07-20. ^ "Willard reviews at Metacritic.com". Metacritic. Retrieved 2009-07-20. This page was last edited on 6 March 2019, at 16:16 (UTC).